Ph.D. in Mathematics, Moscow University. analysis, partial differential equations, asymptotic methods, continuation of wave fields, wave propagation, mathematical modeling in materials science. M. Aldawsari and T. Savina, ``On a Dirichlet to Neumann and Robin to Neumann operators suitable for reflecting harmonic functions subject to a nonhomogeneous condition on an arc '', ArXiv, (2019), 13 pp. T. Savina, ``From reflections to elliptic growth'', ArXiv, (2018), 19 pp. M. Mroz, S. Tenney, T. Savina, and M.E. Kordesch, ``Thermionic emission microscopy of scandium thin film dewetting on W(100)'', AIP Advances, 8, (2018), 065114; doi: 10.1063/1.5039612. T. Savina, L. Akinyemi, and A. Savin, `` On a two-phase Hele-Shaw problem with a time-dependent gap and distributions of sinks and sources'', Journal of Physics A: Mathematical and Theoretical, 51 (2018), no. 4, 045501 (16pp). L. Akinyemi, T. V. Savina and A.A. Nepomnyashchy, `` Exact solutions to a Muskat problem with line distributions of sinks and sources'', Contemporary Math., 699 (2017), 19-33. K. Malaikah, T. V. Savina and A.A. Nepomnyashchy, `` Hele-Shaw flow with a time-dependent gap: the Schwarz function approach to the interior problem'', Contemporary Math., 667 (2016), 199-210. T. V. Savina and A.A. Nepomnyashchy, `` The shape control of a growing air bubble in a Hele-Shaw cell'', SIAM J. Appl. Math., 75 (2015), no. 3, 1261–1274. T. V. Savina and A.A. Nepomnyashchy, `` On a Hele-Shaw flow with a time-dependent gap in the presence of the surface tension'', Journal of Physics A: Mathematical and Theoretical, 48 (2015), no. 12, 125501 (13pp). T. Savina, ``On non-local reflection for elliptic equations of the second order in R^2 (the Dirichlet condition)' ', Transactions of the American Mathematical Society, 364 (2012), no. 5, 2443-2460. 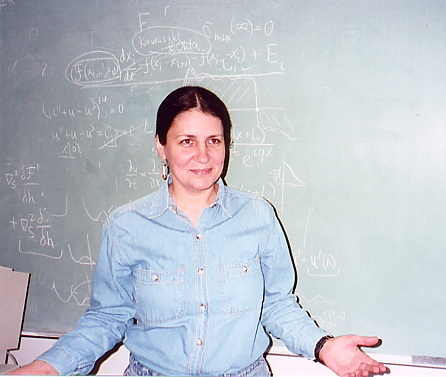 T. V. Savina and A.A. Nepomnyashchy, ``A dynamical mother body in a Hele-Shaw problem'', Physica D, 240 (2011), 1156-1163. T.V. Savina, ``On the dependence of the reflection operator on boundary conditions for biharmonic functions'', Journal of Mathematical Analysis and Applications, 370 (2010), 716-725. T.V. Savina, ``On the structure of the reflection formula for the biharmonic equation'', in: 7th International Conference on Mathematical Problems in Engineering, Aerospace and Sciences, S. Sivasundaram, editor, Cambridge Scientific Publishers, (2009). B.P. Belinskiy and T.V. Savina, ``The Schwarz reflection principle for harmonic functions in R^2 subject to the Robin condition'', Journal of Mathematical Analysis and Applications, 348 (2008), 685-691. T.V.Savina, ``On splitting up singularities of fundamental solutions to elliptic equations in C^2'', Central European Journal of Mathematics, 5 4 (2007) 733-740. T. V. Savina, A.A.Nepomnyashchy, and A.A.Golovin, ``Delayed feedback control of rapid directional solidification'', J. Crystal Growth, 307 2 (2007), 490-499. T.V. Savina, B.Yu.Sternin and V.E.Shatalov, ``On a minimal element for a family of bodies producing the same external gravitational field'', Applicable Analysis 84, (2005), no. 7, 649-668. A.A.Golovin, M.S.Levine, T.V.Savina and S.H.Davis, ``Faceting instability in the presence of wetting interactions: a mechanism for the formation of quantum dots'', Phys. Rev. B 70, (2004), no. 23, 235342, 11 p.
T.V.Savina, P.W.Voorhees and S.H.Davis, ``The effect of surface stress and wetting layers on morphological instability in epitaxially strained films'', J. Appl. Phys. 96, (2004), no. 6, 3127-3133. T.V.Savina, A.A.Golovin, S.H.Davis, A.A.Nepomnyashchy and P.W.Voorhees, ``On faceting of a growing crystal surface by surface diffusion'', Physical Review E 67, 021606, (2003), 1-16. T.V.Savina, A.A.Nepomnyashchy, S.Brandon, D.R.Lewin and A.A.Golovin, ``Suppressing morphological instability via feedback control'', Journal of Crystal Growth, 240 (2002), 292-304. T.Savina, A.A.Nepomnyashchy, S.Brandon, A.A.Golovin and D.R.Lewin, ``Feedback control of morphological instability'', J. Crystal Growth 237-239 (2002), 178-180. D.Aberra and T.Savina, ``The Schwarz reflection principle for polyharmonic functions in R^2'', Complex Variables Theory Appl. 41 (2000), no 1, 27-44. T.V.Savina, ``A reflection formula for the Helmholtz equation with the Neumann condition'', Comput. Math. Math. Phys. 39 (1999), no. 4, 652-660. T.V.Savina, ``On a reflection formula for higher-order elliptic equations'' , Math. Notes 57 (1995), no. 5-6, 511-521. T.V.Savina, B.Yu.Sternin and V.E.Shatalov, ``On the continuation of solutions in domains with a piecewise-analytic boundary'', (Russian), Dokl. Akad. Nauk 341 (1995), no. 1, 24-27. T.V.Savina, ``On the law of reflection for higher-order elliptic equations'', Russian Acad. Sci. Dokl. Math. 48 (1994), no. 2, 380-383. T.V.Savina, B.Yu.Sternin and V.E.Shatalov, ``On the reflection formula for the Helmholtz equation'' (Russian), Radiotekh. i Electron. 38 (1993), no. 2, 229--240. T.V.Savina, B.Yu.Sternin and V.E.Shatalov, ``On the reflection law for the Helmholtz equation'', Soviet Math. Dokl. 45 (1992), no.1, 42-45. N.A.Kudryashov and T.V.Savina, ``Invariant solutions of an equation of gas filtration in a porous medium for large Reynolds numbers'' (Russian), Mat. Model. 2 (1990), no. 12, 122-126. T.V.Savina, B.Yu.Sternin and V.E.Shatalov, ``Reflection Formulas and Continuation of Solutions to Boundary Value Problems'', Section in the book: Boris Sternin and Victor Shatalov, Differential Equations on Complex Manifolds, Kluwer Academic Publishers, Dordeht-Boston-London, 1994. T.V.Savina, B.Yu.Sternin and V.E.Shatalov, ``Notes on mother body in geophysics'', Preprint Max-Plank Institut fur Mathematik, Bonn, MPI/95-90, 23 p.
Spring 2019: Math 4/5310 (Complex Variables), Math 3980T (Junior Mathematics Tutorial), Math 7400 (Topics in Differential Equations), and Math 8950 (dissertation). Fall 2018: Math 6310 (Complex Analysis), Math 2302 (Calculus II), Math 7400 (Topics in Differential Equations), and Math 8950 (dissertation). Spring 2018: Math 4/5310 (Complex Variables), Math 6930 (Independent Study), Math 6942 (Project in Mathematics Education Research), and Math 8950 (dissertation). Fall 2017: Math 6310 (Complex Analysis), Math 3400 (Differential Equations), Math 4310 (Complex variables), and Math 8950 (dissertation). Spring 2017: Math 4/5310 (Complex Variables) and Math 8950 (dissertation). Fall 2016: Math 3/5200 (Appl. Linear Algebra), Math 2301 (Calculus I), and Math 8950 (dissertation). Spring 2016: Math 3/5320 (Vector Analysis), Math 4/5310 (Complex Variables) and Math 8950 (dissertation). Fall 2015: Math 3/5200 (Appl. Linear Algebra), Math 6310 (Complex Analysis), Math 7300 (Topics in Analysis), and Math 8950 (dissertation). Spring 2015: Math 3300 (Calculus III), Math 4/5310 (Complex Variables), and Math 7300 (Topics in Analysis). Fall 2014: Math 7400 (Topics in Differential Equations). Spring 2014: Math 3300 (Calculus III), Math 4/5310 (Complex Variables), Math 4940 (Mathematics Research). Fall 2013: Math 2301 (Calculus I), Math 4/5400 (Advanced Differential Equations). Summer 2013: Math 4310 (Complex Variables) and Math 3300 (Calculus III). Spring 2013: Math 3/5320 (Vector Analysis), Math 4/5310 (Complex Variables), Math 8950 (dissertation). Fall 2012: Math 1350 (Survey of Calc. ), Math 3300 (Calculus III) and Math 8950 (dissertation). Summer 2012: Math 895 (dissertation). Spring 2012: Math 670C (Complex Analysis), Math 4/570 (Complex Variables), Math 741C, Math 692. Winter 2012: Math 670B (Complex Analysis) and Math 266B (Calc. Appl. Biology II), Math 741B, Math 692. Fall 2011: Math 670A (Complex Analysis) and Math 266A (Calculus with Applications to Biology I), Math 741A. Summer 2011: Math 849 (Topics in Applied Mathematics) and Math 490 (Topics in Mathematics). Spring 2011: Math 410/510 (Matrix Theory) and Math 263A (Calculus I). Winter 2011: Math 340 (Differential Equations) and Math 263C (Calculus III). Fall 2010: Math 340 (Differential Equations) and Math 410/510 (Matrix Theory). Spring 2010: Math 4/570 (Complex Variables). Winter 2010: Math 263B (Calculus II) and Math 263C (Calculus III). Fall 2009: Math 4/540 (Vector Analysis) and Math 263C (Calculus III). Spring 2009: Math 4/510 (Matrix Theory). Winter 2009: Math 340 (Differential Equations) and Math 266A (Calculus with Applications to Biology I). Fall 2008: Math 263A (Calculus I) and Math 263B (Calculus II). Spring 2008: Math 4/510 (Matrix Theory). Winter 2008: Math 340 (Differential Equations) and Math 266A (Calculus with Applications to Biology I). Fall 2007: Math 340 (Differential Equations) and Math 263D (Calculus IV). Spring 2007: Math 4/570 (Complex Variables) and Math 266B (Calculus with Applications to Biology II). Winter 2007: Math 263A (Calculus I) and Math 266A (Calculus with Applications to Biology I). Fall 2006: Math 4/540 (Vector Analysis) and Math 690 (Complex Analysis).